Hello first year OT's and PT's! 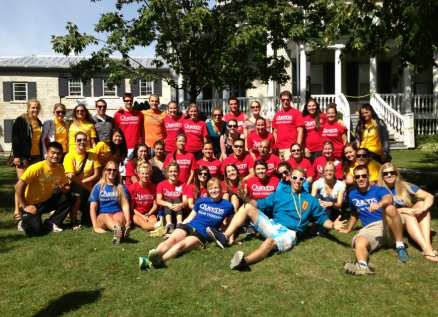 We just want to thank everyone that participated in O.Week 2013!! We had a blast hosting events for you guys and your enthusiasm and willingness to go out and mingle with one another made our job very easy and was really great to see! We hope over the course of the week we have inspired a bond between not only the several people you have met but also between the two programs. We hope you guys will keep this bond alive over the semesters to come!! Special thank you to Mitch Starkman for creating the O-week 2013 video! To the second years that came out to volunteer, helped out with events, worked behind the scene, and to those that came out to mingle and party with the first years thanks for being so much fun, easy to talk to (and drink with), and for being so welcoming!! You guys made a world of difference! Finally thanks to the amazing O.Week team Ellen Lorraine, Iris Loots, Mitchell Starkman, Traci Sanders, and Rob McMillan who helped make this week a success!! I hope you all had the opportunity to thank them for all their hard work, because without them things would not have gone half a smoothly! It is our opinion that this week was a great success and we are so glad we had the opportunity to share this time with you guys! We wish you all the best in your upcoming year!! !